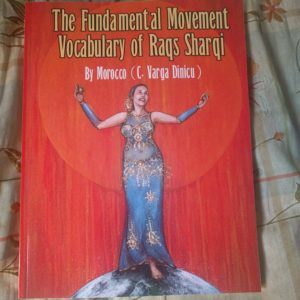 The Fundamental Movement Vocabulary of Raqs Sharqi is a fully illustrated record of dance technique intended for reference purposes for the study of Egyptian Raqs Sharqi. With over 50 years of research and experience, Morocco (C. Varga Dinicu), has worked to bring Raqs Sharqi from “over there” to all audiences and students around the world. This book is the result of over five decades of diligent research, and education in the fields of kinesiology and Raqs Sharqi. The perfect barre, using almost its entire movement vocabulary. In addition,it is kinesiologically designed to go from the larger, more external muscles to the smaller, more internal ones. While this book is not intended to replace live instruction, it makes the perfect mnemonic supplement to one. These movements are the “letters”, the choreographic phrases are the “words”, the dance is the poem – the picture and the arms are the frame: one whole, not isolated or disconnected parts. Breathing is slow and even. Raqs Sharqi is like water. One move flows into the other, with no emphasis unless the musician or singer makes one, in which case we follow. Because we want to do it perfectly, we tend to over analyze and incorrectly overdo. Raqs Sharqi is a social folk dance, done mostly to show happiness and the beauty of the music. It is not a gymnastics contest – “bigger, harder, faster, stronger” are not the goals. Movements won’t feel how one thinks they should or the way they look and they are not done by “feel”: you “put” the hip (or other part) where it should be. These movements are based on real muscles moving in the natural directions of their striations and not, like ballet and other “artificial” dance forms, working against nature, so they often feel much smaller than they are or appear to you to be. To “feel” it, you’d have to make the movement too big and it would be incorrect. You also do not “hit”, “pop” or “lock” – even thinking of those words triggers incorrect tensing impulses and negatively impacts on the movements and the body. When done correctly, the slight movement of the body in the direction you are moving automatically/ naturally puts the hip (or other part) back in the position where it needs to be. FOR YOUR OWN AUTOGRAPHED COPY DIRECTLY FROM THE AUTHOR!!! *Outside of the USA, postage is too expensive, so I recommend getting it directly from Amazon, which has local printers/ distributors &, therefore, lower postage charges. Simple directions, sweet illustrations for smooth correct dance movements.Reminding us of essential body posture and dynamics, moving from large muscles to smaller more intricate ones, this book begins with warmups, continues to classic hip circles, and on to those delicious enchanting “walking” steps and full body curvings then on to the killer rhythmic hip articulations which rock the drum beat. Doesn’t matter if you’re just falling in love with Raks Sharki or have gotten bored and jaded — this book, along with Morocco’s other book – You Asked Aunt Rocky – will rekindle your passion for this most joyful dance. Pick it up, it will make you happy. IT’S HERE!!!!!! I was so excited to have it in my hands — until I turned it over to open the package: that side was all oily with tire treads and footprints on it ——BUT the book inside was in perfect condition!!!!!! Thanks for using such a nice bag! Perfect illustrations! great descriptions! and, WHAT A LOT OF WORK!!!!! I read it with a smile on my face (not through yet, though) things changed since I learned to dance (1972) and back again – thanks for reigning in all the “pop-and-lockers” and the ones who always are of the opinion that “bigger, harder, faster, stronger” is the way to the best dance. I am very tall, so I had to be reigned in from dancing all over the floor too! I can see that “contest” in the other dances: the Irish Dancers, the Hula dancers, even ballet. Everyone has either forgotten their origins – or believe that the “old” way is not the best – then there is the “fusion” with other dances from other countries! I first remember hearing the music as so strange-sounding ——then I thought it was the most wonderful music in the world —it still calls to me to dance, even though I have to sit in a chair now ——but now I play middle-eastern percussion and even sing a bit in Arabic and oh I have the memories!!!!!! You look so beautiful on the cover – and I love the inclusion of your dress design for the back! Now – back to reading! Thank you for ALL your dedication to this beautiful form of expression! 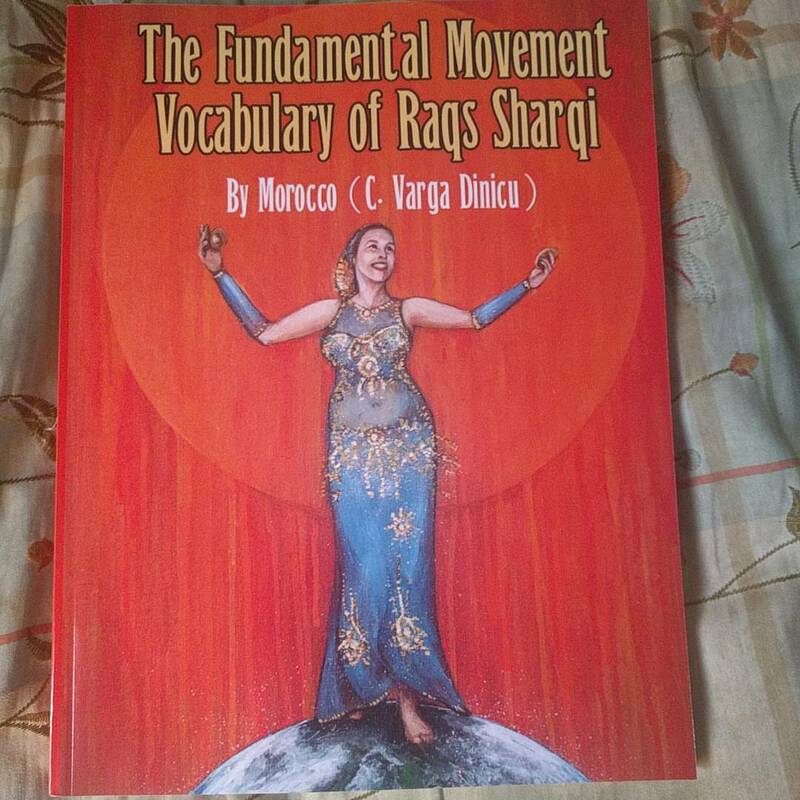 “The Fundamental Movement Vocabulary of Raqs Sharqi” By Morocco C. Varga Dinicu. First Edition 2016 by RDI Publications Virginia Beach, VA USA. What were you doing fifty years ago? Had you even been born yet? Fifty years ago, Morocco C. Varga Dinicu was already studying and performing Raqs Sharqi, the dance art of the Middle East. Gathering insight, knowledge and experience from field recordings and interviews, learning from professional performers and at indigenous folkloric celebrations, extensively performing and comprehensively teaching, Morocco has distilled over five decades of experience in twenty countries to present the succinct, the detailed, “The Fundamental Movement Vocabulary of Raqs Sharqi”. In a dance form traditionally disseminated visually – and unlike ballet, without definitive movement vocabulary – identifying component postures and movements can vary across teaching platforms. In this volume, Morocco strives to identify a logical, comprehensive, basic movement vocabulary using insight culled from Anatomy and Kinesiology. Concise and detailed text accompanies clear figure drawings of these often subtle movements. After a warm up description, a compilation of arm movements are displayed then added to the following index of thirty-eight different and distinct hip articulations. Appropriate tempos are suggested for accompanying the movement practice. Discretion is logically explained, for example in Hip Articulation: Up & Down: “Torso and head stay level and do not go up or bounce, either of which would obscure the movement.” Although closing with a suggested menu of steps into simple choreography is tempting, Morocco leaves this task to the performer, saying: “These movements are the letters, the choreographic phrases are the words…”. Thus the poetic dance expression remains the performer’s personal and unique interpretation. Morocco’s voluminous, internationally recognized accolades as a dancer and educator confirm her authority on this subject matter. 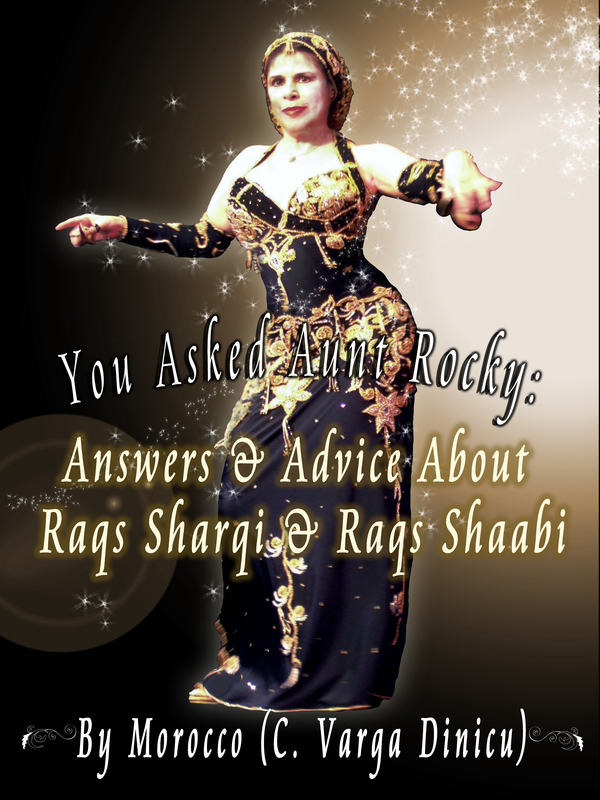 Although you cannot learn how to dance from a book – a live teacher and correction are mandatory – “The Fundamental Movement Vocabulary of Raqs Sharqi” goes far to serve as a reminder and technique strengthener for students, as well as a fun directory for teachers creating class drills. How can one put dance on paper? How can a mesmerizing, erudite dancer condense half a century of knowledge in one book? How can she, who has acquired and developed the art of Raqs Sharqi from the “aunties, grannies, uncles & cousins dancing from a place of joy within themselves”, expect us to learn anything at all from… reading? The short answer is: she so can. See for yourself. If you are new to the dance, this book will make you understand what it is about. If you have been captivated by oriental dance, and have tried your hips at it (as I have), this book will make you understand what it is all about. It is about flow, harmony, passion, humbleness, irony, respect. That, Morocco has put in her book,and only she could have had the creativity and the stamina to do it. It is not an easy romp. You can flip through it superciliously, but I have used it as an instructions manual, and it has drawn me in – and drained me out. The descriptions are precise, the method rigorous, the discipline demanding. Morocco fully captures the implications, at this point in Western history, to require us to use more application and concentration, to read and think, quietly – rather than watch and go along. Thank you for this book, Aunt Rocky.